This is it! The class is ending today, but this page will stay open for ever and you can post your graduation videos at any point. But it's best to hurry up since gathering of "like"s starts whenever it's posted. Whoever has the biggest number of likes (only "likes" on this website count - those given directly on YouTube and Facebook don't count to make it easier to track) by April 10 gets a free next class of their choice - And the next two get a free download link to a training video of their choice! Looking forward to see all those talented pups graduate!!! - And of course, looking forward to see many of you next week again in Foundations! For those who are too young for this class, next one will start in August. 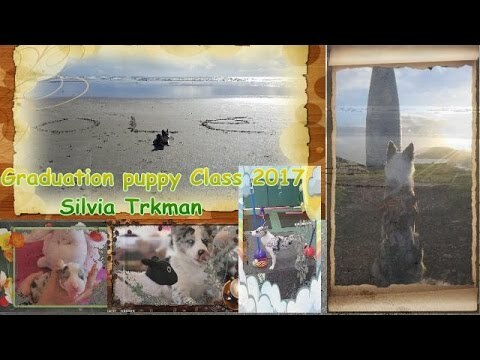 Frizz, Puppy Class Graduation Video! Amazing little Frizz!!! Sooo well mastered puppy tricks! And sooo cute! 🙂 Can’t wait to see her rock Foundations too! Hi Silvia and classmates !! Here you are our graduation video ! This class was too nice, we had a lot of fun : Musli and I have learned a lot of tricks and Silvia’s tips are the best ! I haven’t the same dog than before any more. 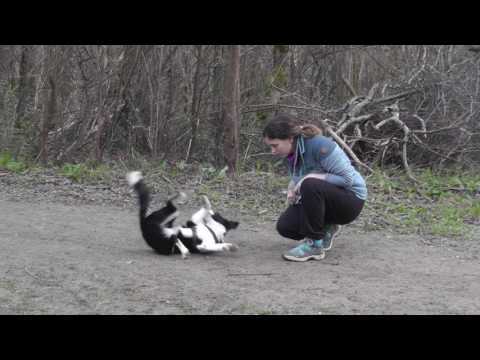 Now, Musli loves working and learning new tricks -- always motivated. Every morning, she wants to work. I would like to say a big thanks for this class, we are a little sad that it is already the end ! Impressive!!! Really well mastered tricks! -- And really great attitude! Love the video too -- so well made! And wow for 4on on a pony!!! 🙂 You two are such a great team, I hope to see you in another class! Thank you ! Yes I would like to follow Foundations Class (surely in August because at the moment, I have lot of work for school and weather is muddy but of course I’ll follow another class or maybe two 😉 ). Great!!! Looking forward to see more of Musli! Yes I’m sure ! Maybe not the see-saw 😉 It’s not a problem if I have two tunnel (1 meter by tunnel) ? So you have two tunnels, but very short ones? I think it should work yes. Please if you liked, don’t forget to like the video !! You two have sure made an amazing progress!!! She was sooo little when you started, so really amazing to master all this is just 3 months! Such a cool pup! I live in an appartment so I only have 6 jumps, 1 really short tunnel and a slalom, I have an access to my club once a week.. is it possible ? Yes, that should be perfectly o.k.! The class won’t start before 15th August, but probably soon after. Thank you so much Silvia for all your advise, and thank you classmates for all of your inspiration! Happy birthday super Myu!!! She sure made it all look easy! Love the skateboarding and ball rolling! Beautiful video too! Congraduation and Happy birthday Myu! We had so much fun during the class & we learned a lot ! Blisse did an amazing job ! We couldn’t wish for a better start ! Thank you Silvia for all your advice and tips ! We really enjoyed the class ! You’ll see us in august foundations ! Blisse is sure the coolest little pup! Sooo smart and sooo focused -- really amazingly well mastered tricks for her age! I will certainly follow the Foundations in August too 🙂 Great video ! Presenting our Graduation Video.. :)I wouldn’t have believed it, if someone had told me four months ago that she would be able to do sooo much, in sooo little time considering her injury…:). So Happy and proud at the same time…Thanks once more for your great classes and keep my motivation for dog training going.. ahahha :). Wow, she has sure made some progress!!! Amazingly lots of well mastered tricks and soooo much better use of the leg!!! She looks so good on that heeling, you could hardly know she has no hip! Not letting anything stop her!!! here I want to show you our graduation video! We had so much fun and have learned so many thing during this class! Thank you Silvia and classmates! All ready for Foundations! Great job with all the tricks! Loved figure 8s and one object to another! These videos are so good! I need to think if I even the guts to post of video of Baloo and I as we are not even close to that. He sure looks great as well! So we sure want to see him too!